Bidibot, the web’s premier penny auction site for gamblers, has teamed up with world leading poker site PokerStars to offer several auctions daily on PokerStars’ Sunday Quarter Million ($250,000) event and on PokerStars’ Daily $90,000 tournaments. Bidibot users need only to log into their www.bidibot.com account to bid on entry into these massive tournaments. Each bid raises the bid price by just a penny, and the winner of the auction gets to play in the either PokerStars Sunday Quarter Million or Daily $90,000 for just a fraction of the normal price. Last week player “tlofts” won a seat in this Sunday’s quarter Million guaranteed tournament for just $1.01, a savings of 90.82% off the tournament entry’s normal cost. “Bidibot saved ‘tlofts’ a huge percentage off the cost of a tournament that regularly gets 3,000 players. I am confident that no on else has gotten as good a deal as ‘tlofts’ for Sunday’s most popular tournament” according to Bidibot founder John Tabatabai. 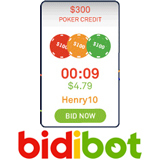 Bidibot’s online poker penny auction site isn’t just offering value for its punters, but is offering a fun way to save on poker tournament entries, casino credit, and various other prizes including iPads and Nintendo Wii. Unlike the majority of offers on the net, gaming credit items won on Bidibot are NOT paid in Bonus credit, and therefore do not require adherence to bonus play through and deposit requirements.